Our little town juts out into a very big lake. And everyday, I take a three-mile walk, along the lake, winding through wood and field. I love the flora and fauna along the trail, all the critters from buzzards to bobcats (Texas) and the breathtaking seasonal changes. But I hate the plastic bags snagged in the brush and branches. Nevertheless, the cussed things are sure handy for toting groceries and stuff. What to do? Bag bans seem to be gaining momentum. State Delegate Alfred C. Carr (D-District 18), for example, is fixin’ to introduce a bill (The Chesapeake Bay Restoration Consumer Retail Choice Act) that would slap a nickel tax on new plastic and paper bags used by Maryland shoppers. Last September, California senators balked at an Assembly-approved bill that would have made the state the first in the nation to ban all plastic shopping bags. 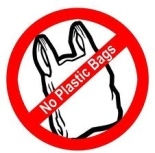 AB 1998 would have outlawed single-use plastic bags in grocery stores and pharmacies, starting next year and in liquor and convenience stores in 2013. The idea was to encourage shoppers to bring their own reusable totes. Nevertheless, a couple of months later, Los Angeles County passed a law affecting more than a million residents of unincorporated areas: “No store shall provide to any customer a plastic carryout bag.” An exception would be made for plastic bags used to hold fruit, vegetables or raw meat in order to prevent contamination with other grocery items. Plastic bags have been contraband in San Francisco since 2007. Paper or plastic? Or lauhala bag? The writer of the international bestseller, Son of Hamas, Ron Brackin has traveled extensively in the Middle East as an investigative journalist. He was in the West Bank and Gaza during the Al-Aqsa Intifada, on assignment in Baghdad and Mosul after the fall of Iraq and more recently with the rebels and refugees of Southern Sudan and Darfur. He has contributed articles and columns to many publications, including USA Today and The Washington Times. Ron is the author of other nonfiction books, including Sweet Persecution, Between 2 Fires and Iraq, My Handiwork. He was a broadcast journalist with WTOP-AM, Post-Newsweek’s all-news radio station in Washington D.C. and weekend news anchor on Metromedia’s WASH-FM. And he served as a congressional press secretary under the Reagan Administration. Visit his website at www.ronbrackin.com. I think we have a huge mess but not because of platic bogs or trash. The problem is that there are just too many people who are unconcerned, unaware, asleep, or just dont care. Stop trashing the Earth people!